Thirty plus years of mount design and building expertise has been employed to engineer and manufacture our new 1600GTO mount into the most robust, high-precision mount in its class. We have enhanced its design and utility by incorporating additional optional features like absolute encoders, sophisticated control systems and a precision polar scope to meet the needs of even the most demanding astro-imager or visual enthusiast. We offer three versions: 1600GTO, 1600GTO-AE and 1600GTO-AEL. The latter two versions include the Standard Temperature Absolute Encoders or the Extended Temperature Absolute Encoders, respectively. If you order the 1G00GTO without the absolute encoders, you will be able to purchase them at a later date to install yourself. Extremely solid, rugged, high payload mount, yet the equatorial head comes apart into two components – a true advantage for a mount of this class. Azimuth adjusters are positioned to the rear of mount which allows you to make minor corrections quite easily without reaching or moving around the mount. Since the knobs are in front of you as you look through the polar scope, the graduations can be more easily seen as you dial in your position. Built-in precision-rotating pier adapter for smooth azimuth adjustments. Altitude range now extends from 0-78 degrees, which makes it suitable for most anyone except the extreme polar locations. Motor cables are built into the mount and routed internally to remove the possibility of snagging. Use the clutches to easily balance your setup, then lock the R.A. and Dec. axes so that they cannot move when the motors are engaged. Manual operation is possible if power is not available. The mount will track and guide well past the meridian in either direction if the object is located so that the telescope will clear the pier. This allows the user to set up the mount for a long series of exposures without stopping in the middle to flip sides. One can start the telescope under the mount while pointing at an object in the eastern part of the sky and track it all the way deep into the western sky. This is very useful for long exposure H-alpha or in cases where a large number of individual exposures are needed for stacking. This feature of our GTO mounts has been a real customer favorite for many years. Our optional Right-Angle Polar Alignment Scope will allow you to quickly zero in on the pole or the polar alignment routine in PEMPro (included) will guide you through the process. You can even align the mount during the day with our clever Daytime Polar Alignment Routine (outlined in the Keypad Manual) for solar observing, viewing the planets at twilight, or just getting a jump start on a long night. You have your choice of the GTO Keypad (optional), which is a full-featured handheld computer, PC computers using a wide variety of software with or without our ASCOM driver, Mac computers or even your mobile smart device (like your iPhone or iPad). Our motor/gearboxes were designed to be responsive for precision astro-photography, while at the same time making it super easy to use and adjust. Absolute Encoders on both axes provide error-free tracking, software readable absolute position, and customizable home and limit functions for robotic imaging. This option can be installed when you purchase your mount (order either the 1600GTO-AE or 1600GTO-AEL version) or you can purchase the option as an upgrade kit when you are ready to take advantage of its capabilities. Using modern CNC machining techniques, we make all components to a high-precision level, which results in a final package that is solid and accurate in all respects. The critical angles are accurately machined so that the mount is orthogonal to a very high degree. This results in pointing accuracies well below 1 arc minute for a properly aligned mount. Massive thrust bearings and preloaded shaft bearings provide excellent stability under all imaging situations. The design of the 1600GTO is straightforward and easy to maintain. We provide information in the Technical Support section of our website pertaining to typical adjustment issues. All electronics including the GTOCP4 control box, motors, gearbox or cables can be removed for servicing. The RA and Dec axes can be shipped separately, if needed. The GTOCP4 drive system uses a high-quality Swiss DC servo motor controlled by a microprocessor to an accuracy of 0.05 arc-seconds per step. Tracking is very smooth and repeatable from one worm cycle to the next, which enables PE correction to be very accurate. The system can be precisely controlled over a speed range of 4800:1, which allows 0.25x sidereal for manual guiding to 1200x sidereal for 5 degree per second slewing. The circuit draws approximately 0.5 amps when tracking the stars, 2.5 amps with both motors slewing and requires only 12 volts to operate. The servo drive will satisfy the requirements of the sophisticated, advanced astro-imager, yet is easy for the casual, visual observer to use. The heart of this mount is a precision gearbox using custom high-quality fine-pitch gears, coupled to a highly accurate worm and worm wheel. These parts are manufactured and assembled at our facility and individually tested to meet or exceed our periodic error specification of 7 arc seconds (+/- 3.5 arc sec.) before introducing any periodic error correction. The PE is smoothly variant with extremely low ripple or moment to moment error. In contrast, mounts that use commercial gearboxes have very small spur gears with tiny teeth and too few of them. This generally causes ripples in the tracking rate which are difficult to guide out. Each mount is rigorously tested on our specialized periodic error tester. Only mounts that provide an accuracy of 7 arc seconds or better will pass this inspection. If the mount exhibits greater error, the substandard part is identified, replaced and the mount is retested. As mentioned above, the spec of 7 arc seconds (+/- 3.5 arc sec.) is the maximum native mechanical error inherent in the mount's RA axis WITHOUT any software correction. In order to optimize performance even further, we use a special version of Ray Gralak's PEMPro developed specifically for our test equipment. We generate a unique PE curve for each mount that we program into each GTOCP4 Control Box. Simply use the optional Keypad or your Astro-Physics software (ASCOM V2 driver, PulseGuide or APCC) to turn the PE Correction "on" and you will see results significantly better than our published 7 arc second spec without additional PEMPro runs! However, you may use PEMPro to further refine your PE, if you chose to do so. 1100GTO-AE or 1100GTO-AEL: If you purchase either of these versions that feature absolute encoders, the final in-house PEMPro run will utilize the corrections of the absolute encoders and the values will be stored in the GTOCP4 Control Box. The GTOCP4 contains all of the circuitry to drive the two servo motors and the logic required to navigate the sky. It can be easily removed from the mount, if required. The 1100GTO uses the same GTOCP4 Control Box as 1600GTO and Mach1GTO. In fact, the control boxes for all three mounts are interchangeable with one another in an emergency. However, the absolute encoder function is only available in the control boxes sold with those mounts. Be sure to review extensive information regarding the GTOCP4. To determine the appropriate pier height for your system and to calculate many of the dimensions that vary with your latitude setting, please try this Excel spreadsheet Latitude Dimension Calculator. Capacity Approximately 220 lb. (100 kg) of scope and accessories, depending on length. Recommended for refractors up to 250 mm, 18-20" Cassegrains, Ritchey-Chretiens and CDKs. These are only guidelines. Some telescopes are very long for their weight or heavy for their size and will require a larger mount. Remember also that imaging requirements are more rigid than visual observation. 9.775" (248.3 mm) Base. The base is an integral part of the mount and azimuth adjuster. PEMPro (Periodic Error Management Professional), Version 3, by Sirius Imaging is included with this mount. It is a very powerful Windows software application that allows you to correct your mount's periodic error, polar alignment and backlash using your CCD Camera or Webcam to dramatically improve tracking and guiding. As mentioned previously, our extensive testing procedures include several PEMPro runs so that your new mount will perform with optimum PE correction out of the box. Simply use the Keypad, the ASCOM driver or APCC software to turn PE Correction "on." Although you will not need to use PEMPro when you receive your mount, you may wish to do a PEMPro run at a later date after the worm gear has run in. Depending on usage, re-measuring error and re-loading periodic error correction from one to four times a year is a good practice, especially if you do some unguided images from time to time. PEMPro also includes a powerful polar alignment routine. The 1600GTO mount has been designed and engineered to accommodate the use of extremely precise Absolute Encoders. We invite you to review the technical information regarding the encoders and find out what they can do for you. Absolute Encoders allow the mount to know its exact location regardless of accidental software errors and will allow its recovery. This is particularly important in remote setups. Furthermore, they virtually eliminate periodic error, reducing it below 0.2 arc seconds in our tests. If you order the 1600GTO-AE or 1600GTO-AEL, the R.A. and Dec. encoders will be installed and fully tested with the mount prior to shipment. However, if you purchase the 1600GTO without encoders, you may purchase the Absolute Encoder Kit at some point in the future and install them yourself. All items listed above for the 1600GTO-AE, except that the Readheads are the Extended Temperature Version. Counterweight: Stainless Steel Counterweights - 5, 10, 18 and 30 lb. Portable Rechargeable 12-volt Battery Pack: Several sizes and types are available from a variety of vendors. Be sure that your battery pack can supply adequate power for an entire observing session! We recommend having separate batteries - one for the mount and another for all other accessories: camera, dew removers, etc. We do not offer any battery packs at this time. 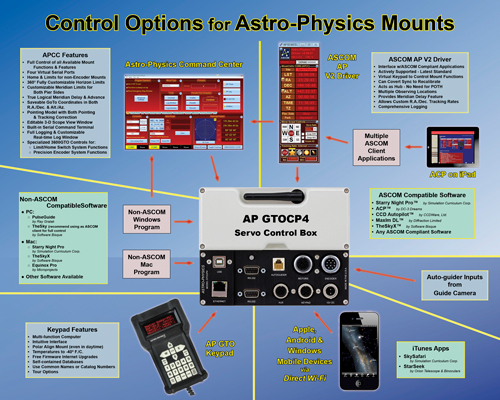 During the 2016 Northeast Astronomy Forum (NEAF),Roland Christen of Astro-Physics demonstrated some of the functions of the Auto-Adjusting Motor/Gearboxes, the Absolute Encoders and GTOCP4 Control Box (begins at 4:14). Dennis DiCicco, editor of Sky & Telescope magazine, opens the interview with a discussion of the 17" f8 Flat Field Astrograph. The 1100GTO was introduced at the Northeast Astronomy Forum (NEAF) in Suffern, NY in April 2013. In the video below, George Whitney, from the Astro-Physics Technical Support staff, explains key features of the 1100GTO in an interview conducted by Dennis DiCicco, Sky & Telescope editor. We also invite you to view the entire video for demonstrations of these additional exciting products: 1600GTO German Equatorial mounts with discussion of the Absolute Encoder System used in both the 1100GTO and 1600GTO mounts, Right-Angle Polar Alignment Scope, the 10 x 60 Vario-Finder with Quick Release Guider Bracket and the Astro-Physics Command Center (APCC) software.